T T T T T T T T T T T! That's what this photo is designed to do. 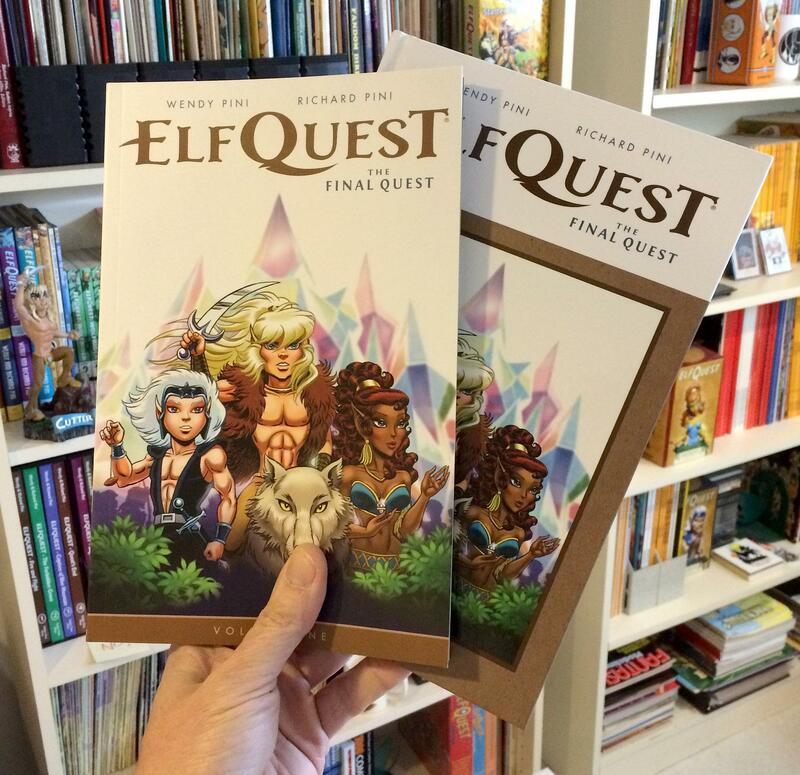 Dark Horse just sent advance copies (the softcover ships April 1, no fooling) of the collected "Elfquest - the Final Quest" volume 1. It's 192 pages and contains the special preview issue, plus #1-6, and it's even more gorgeous than the individual comics! But wait, he said the softcover ships April 1 ... then what's that other one? That, cubs, is the limited hardcover version that Dark Horse has prepared as a San Diego Comic-Con exclusive. And before you ask, no, they are not available outside the convention, which runs July 8-12. And no, we don't know how many (or few) they've printed. So if you're going, or you know someone who is, you probably want to put this book on your "get it" list. Nice! This is going to just to the top of the list for collectors for sure. Would have loved the hardcover... but the softcover is cool too!! Besides, as much as I'd want to, I can't visit the US. Hardcover would have been fine since it is (supposed to be) more durable for long term storage. I guess the contents is basically the same like the single booklets? @jaRf - Don't feel too bad. It's about 2000 USD for flight and hotel for me too and I live in the U.S.! Maybe Wendy and Richard will go to Chicago. That's only a 4-hour drive for me. Still... it's great that the book is coming out in April. Guess I'd better go pre-order from Dark Horse! I have had both hardcovers and softcovers for about 15 years, and only one softcover is shoving some wear. (salivating, tail wagging) Ooo, can't wait! jaRf said: Yeah, just 2000 USD for a flight and entry fee and then 25 $ for the HC. Curious - where did you see a price for the hardcover? It was a guess. :) I'd expect it to be in the range of 20 to maybe 50 USD depending on the amount of pages. And I wanted to have a comparatively low price in contrast to the price for flight and everything else. I think most of the HC editions are going fairly well. They fit better upright into any bookshelf and are more sturdy on long term (or if you happen to have children and they start reading ElfQuest). So I guess maybe more people would have bought that than the relatively limited number in terms of audience that can make it to an exhibition / convention like that.